Light aroma of malt, chocolate and licorice coming from the pour. 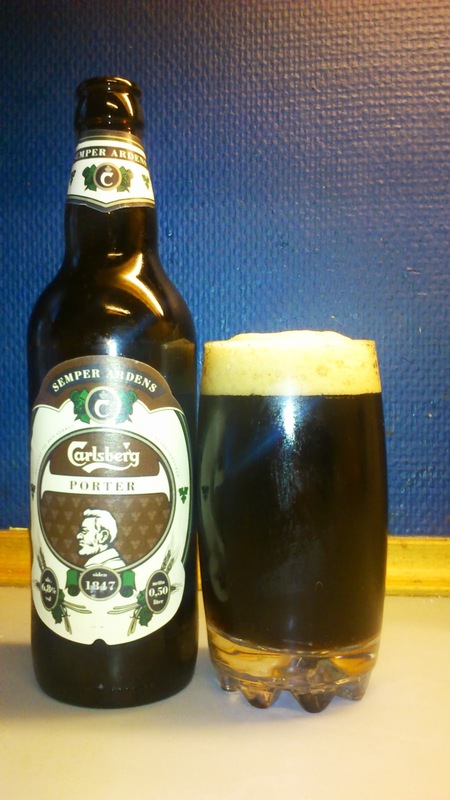 This Porter pours black with a dark ruby tinge and has a creamy beige head. Quite sweet on the intake with dark roasted/almost burnt tasting malt, dark chocolate and a dab of licorice while the finish is bittersweet. This has a pleasant long-ish aftertaste of malt, licorice and milky coffee. Smooth mouthfeel though a bit oily with no alcohol shining through. Summing up first...decent one bottle only porter that is worth a try. The reason I say one bottle only is mainly personal as I drank two bottles of this while writing this post (I did have other things going on) but during the second I thought it was beginning to be a bit dull, your own mileage may vary of course. While pretty good value for money, bought for 10 dkk, it is not a patch on the afore mentioned Criollo Stout. I don't know if it is a capacity thing but I've always wondered why the Semper Ardens/Jacobsen line do not, to my limited knowledge, get exported ? Answers on a postcard please. I have no problem buying and drinking this again. This scored 7.5/10 on the 'oh, a macro brew, I must mark down' Beerometer.